Dr. Jim Guenther is a graduate of The Ohio State University College of Veterinary Medicine class of 1970. Upon graduation he was an associate at Randall Veterinary Hospital in Cleveland, Ohio. In 1973 Dr. Guenther moved from Ohio to Asheville, NC where he set up an equine/companion animal practice. He successfully managed the practice until the mid nineties when the rigors of equine work and his desire to pursue an MBA led to a career change. In the summer of 1999 he graduated from Pfeiffer University in Charlotte, NC with a dual degree (MBA/MHA). As part of his course work Dr. Guenther laid the foundation for an Emergency/Critical Care 24/7 facility, REACH Hospital in Asheville. Dr. Jeff Johansson is a graduate of the University of Georgia, College of Veterinary Medicine. After earning his veterinary degree, he completed an internship in small animal medicine and surgery at Washington State University. He and his wife moved to Fairview, NC in 2008, and they are so proud to call these mountains their home! Jennifer was born and raised in Dallas, Texas and moved to Asheville in 1997. She is a 2009 graduate of the University of North Carolina at Asheville with a Bachelor’s Degree in Business Management and Administration. She received her Certified Veterinary Practice Manager (CVPM) credentials in 2015. 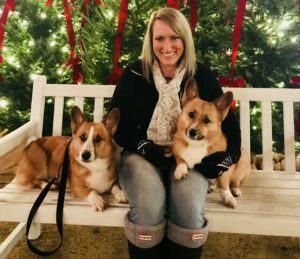 She currently lives in Leicester with her husband, Travis, and their furry children, a Welsh Corgi, Wrigley, and two silly kitties, Avery & Maggie. Their angel Corgi, Brewster, watches over them and Beacon, too! Jennifer enjoys traveling to the coast whenever she can, hitting a few golf balls now and then, and spending time with her family. Carmen grew up in DeKalb, Illinois. She graduated from Iowa State University with degrees in secondary and adult education. Carmen began her career teaching high school home economics in a small, rural Illinois town. Later, she provided home based services for preschool children with disabilities which transformed into designing and implementing educational programs for new parents. With education always being the key to each of her different job positions, working at Beacon as a receptionist has been no exception. Carmen, her husband, three children, and their boxer dog, have lived in several states along the East coast plus in Northern Ireland and England. In her free time, she enjoys designing and sewing clothes, quilting, cross-stitching, and reading. Megan grew up in the small town of Rhinebeck in upstate New York. She has always loved animals and developed a special connection with them at a young age. She moved to Asheville in 2012 and lives with her best feline friend, Charli, who is her absolute world. She is a 2018 graduate of the University of North Carolina at Asheville with a Bachelor’s Degree in Cell and Molecular Biology, and hopes to someday pursue a career in the medical field, whether it be with people or animals. Aside from learning, Megan enjoys music, making art, gardening, hiking, swimming and skiing. She looks forward to meeting all of you and your furbabies! Audria lives in Black Mountain with her feline partner, Raymond. 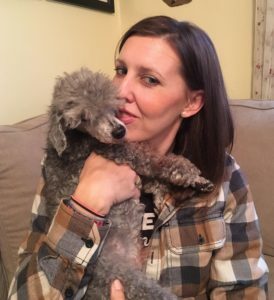 She grew up with many pets in Saluda, NC, raised by a mother who gave her a compassionate heart and love of all creatures. She has traveled many career paths from waitress to museum exhibit fabricator to professional decorative artist to RVT. Graduating from the 2011 AB Tech Vet Technology program, she continued on in specialty and emergency practices. Audria enjoys art, music, creative crafty pursuits, traveling, and a good pint of local cider. She is so excited to be a part of the Beacon Family, and looks forward to meeting you and your furry family members soon. Animals are my passion in life. My heart currently beats for the coolest toy poodle, my best friend, Nova! I have worked in the veterinary field since the age of 15, and graduated from veterinary technician school in 2011. It’s my goal to educate clients about their pets so that they can live long, successful and fun-filled lives. I enjoy anything from nail trimming to Schutzhund training, and have had all kinds of veterinary experience ranging from general practice to ophthalmology. I’ve had the opportunity to work with a variety of animals, from hamsters to cows to baboons. I am honored to call the mountains my new home, and I look forward to meeting you and your adorable fur families!